Related post: What Can International Development Learn From Britain’s Olympic Team? The authors crudely estimate that Brazil’s forest protection policies benefited the climate at a cost of just $1.09-3.25 per ton of avoided carbon dioxide emissions. That’s lower than the $5 per ton that Brazil has been receiving from Norway through the Amazon Fund. It’s also far lower than the costs of reducing emissions in industrial sectors; at the opposite extreme “clean coal” is expected to cost more than $100 per ton. Last year Jens Engelmann and I estimated that achieving large-scale reductions in emissions from tropical forests though carbon pricing would cost less than a quarter of what it would cost to cut emissions from industrial sectors in the US or EU by the same amount. Of course, the relatively low government expenditures documented by Fogliano and colleagues are only part of the story. The opportunity costs to land-users from forgoing clearing for potential new cattle pastures and soy farms are likely far higher, considering that most of the measures Brazil used to curb deforestation involved restricting agricultural expansion in some way: protected areas, indigenous territories, forest law-enforcement backed by satellite monitors, suspension of rural credit to high-deforesting municipalities, soy and beef industry-imposed moratoria on purchasing from high-deforesting farms, and so forth. Still, while Brazil’s policies constrained agricultural expansion, they did not crimp the growth of agricultural production. 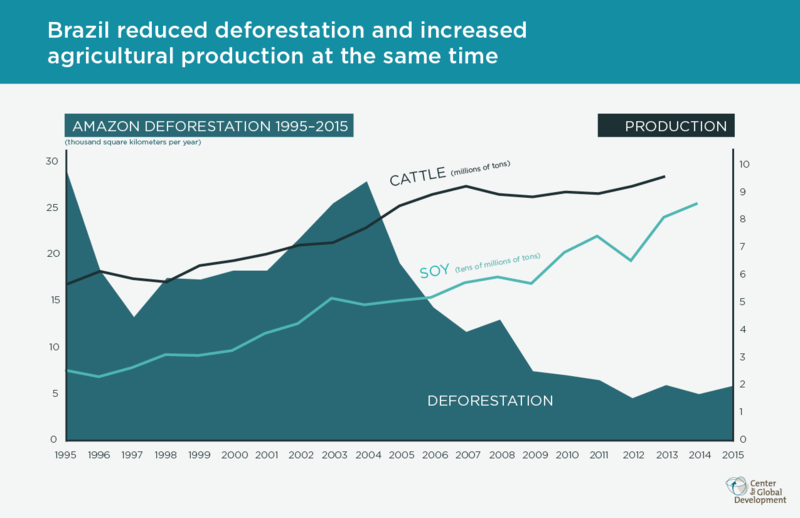 Over the same time 2004-2013 period that Amazon deforestation fell 80 percent, soy production rose by 65 percent and cattle production rose by 21 percent nationwide. This occurred largely thanks to greater production on already-deforested lands in the Amazon, and to a lesser extent, an increase in clearing of the wooded savanna of the Cerrado. While Brazil’s achievement is extraordinary, it has some caveats. The amount of forest Brazil clears every year remains high by world standards. And in the face of political and economic crises, the gains of the last decade appear increasingly under threat (Paulo Barreto presents a detailed and balanced outlook here). Still, what Brazil has achieved on climate, thanks to conserving the Amazon, puts it as far ahead of other countries as Katie Ledecky’s 11-second margin of victory in the 800-meter freestyle. Can Brazil’s success be replicated elsewhere? Ruth DeFries and her colleagues have argued that the Brazilian experience will be tough for other countries to replicate, due to Brazil’s exceptionally strong capacities for governance and forest monitoring. Frances Seymour and I are more optimistic, as we explain in our forthcoming book Why Forests? Why Now? The Science, Economics, and Politics of Tropical Forests and Climate Change. The Amazonian frontier was once arguably as lawless as anywhere in the tropics, but that changed rapidly with presidential attention. Forest monitoring can be outsourced in whole or in part, as in the case of Guyana. And many other countries also have a backlog of low-carbon lands on which agriculture can expand. Furthermore, it is only in hindsight that Brazil’s circumstances can be considered preconditions for success. No one would have suggested in 2004 that Brazil’s conditions meant the Amazon was about to undergo the rapid transformation it did. While Brazil offers valuable lessons, we should be cautious about extrapolating too much from the experiences of a single country. Success stories of reducing tropical deforestation in other countries may result from policies and enabling conditions different than those of Brazil, reflecting the wide diversity of tropical countries. Brazil’s gold-medal achievement in reducing deforestation for more than a decade makes it the Usain Bolt of protecting the climate. But if the world is to see other tropical countries join Brazil on the medal podium, international finance is key, especially in countries where payments can go even farther than in Brazil. Rich countries should increase their support for tropical forest conservation through results-based payments for reducing emissions from deforestation (i.e., REDD+). Opportunities to do so include not only publicly funded initiatives such as the Amazon Fund and the World Bank-facilitated Carbon Fund, but also carbon markets such as California’s, currently in a battle for extension beyond 2020. When it comes to protecting the climate, tropical forests offer a bargain of Olympic proportions.